Disclosure: I received a free Plantronics BackBeat Fit to review because I am a BibRave Pro. (Per usual, all opinions are my own–you should know by now I don't need any help with that, I've got plenty of 'em!) Learn more about becoming a BibRave Pro here. Read and write race reviews at BibRave.com! 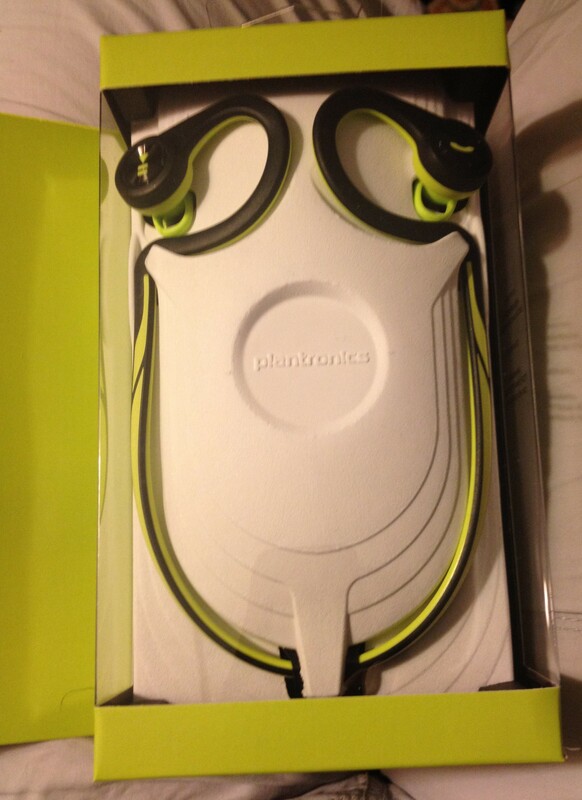 Prior to testing the Plantronics BackBeat Fit wireless headphones, I'd never run with Bluetooth headphones. I'm not sure why I thought I wouldn't like wireless headphones, especially since I'd pretty much stopped running with music due to corded headphone issues. The ear buds that come with the iPhone/iPod are pretty from a design standpoint, but had a tendency to jump out when I run (plus if you sweat on the ones with the volume control thingy on the cord, you can kill them–Awesomeness alert: the BackBeat FIT is 100% waterproof. You can even fully submerge them. Tunes while swimming, anyone??). I'd switched to Yurbuds since they are a huge improvement in terms of both of those issues, but now those are my at-work earbuds. It's probably my naturally graceful movement, but once I'm geared up to run they were sure to snag on something–hat, watch, Road ID, Handana–and yank a bud out of my ear. When the box arrived, I felt like it was just like Christmas! I knew exactly what was inside. Santa Cruz? We're practically neighbors! I forgot to mention that long before Bluetooth, when most of us didn't have cell phones and Apple hadn't invented the iPod, back in the days before we were worried that the Y2K bug was going to cause the end of the universe, that's when I first learned of Plantronics. The context was that I was a student at Coach U., where all of the classes are conducted telephonically via bridge lines. In order to avoid the creaky neck caused by spending hours and hours holding the receiver with your head and shoulder so both hands are free to reference materials and take notes, the Coach U. team recommended all students buy a headset for their phones. (This was a radial notion at the time.) 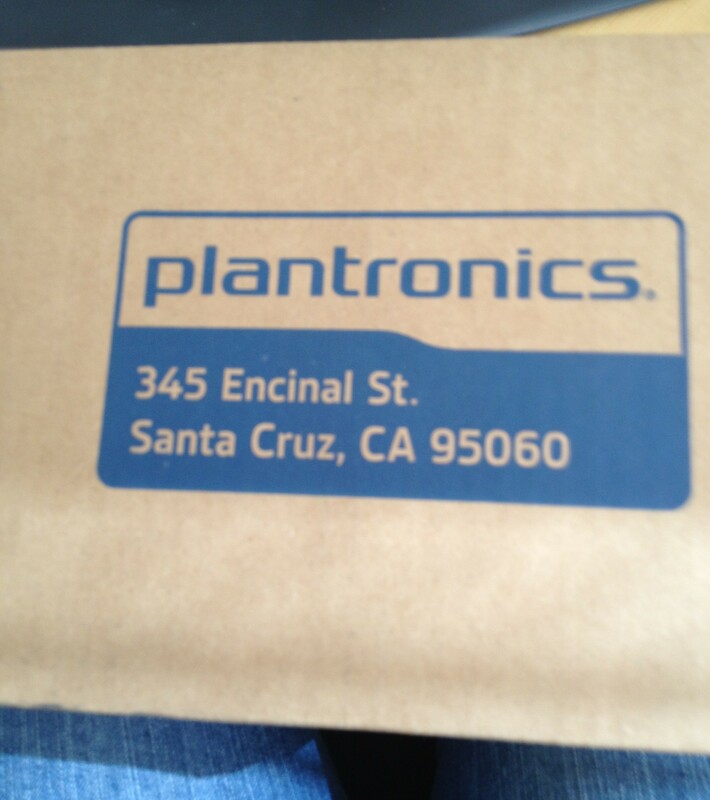 The brand Coach U recommended as the top-of-the-line, best investment was Plantronics. 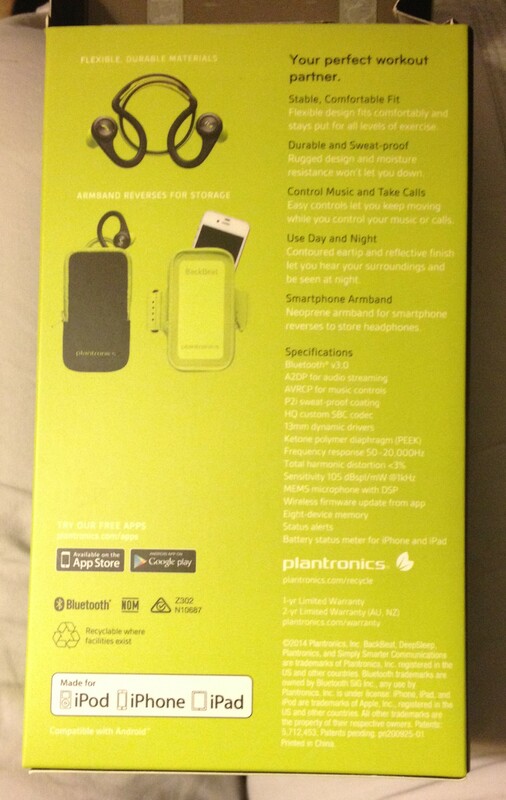 Now I have a Plantronics headset in my office for conference calls and depositions. 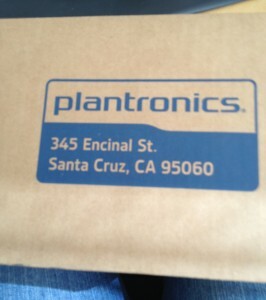 From the context I always associated Plantronics with businesses and offices, so hearing a connection to running was quite the surprise to me. I'm also a giant nerd, and I'm interested in packaging and presentation. Instead of ripping open the package and extracting the contents, I've got to examine all the elements first. 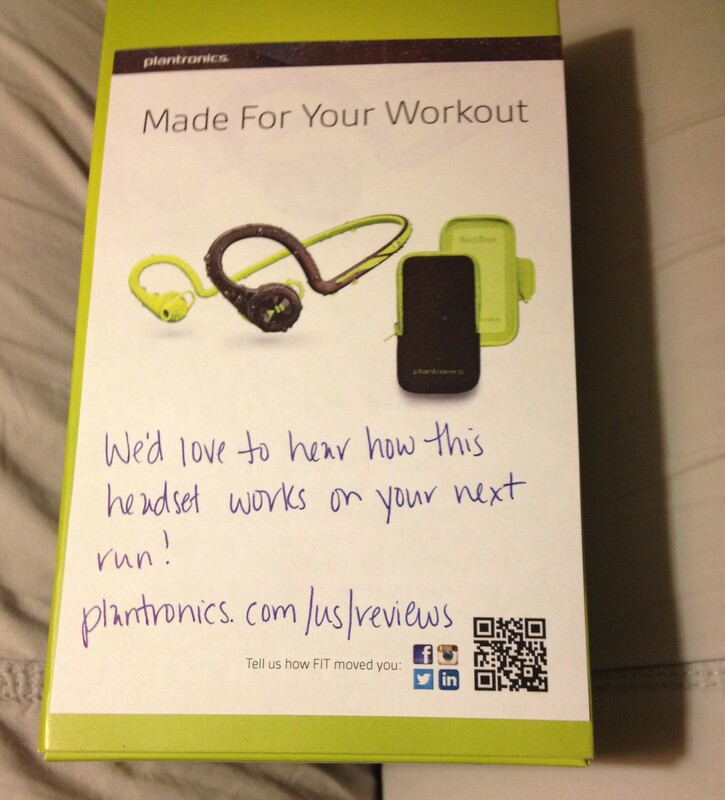 Notice the sticky-note on the box not only has the social media information and a QR code, it also has a color photo of the two most important items in the box, the headset and the carrying case. (The box also contains a charging cable and instruction booklet.) The carrying case is reversible neoprene: turned one way, it's a storage unit for the headphones, cable, and instructions; turned the other, it's an adjustable armband to carry your phone (keys, cash, etc.) while you run. 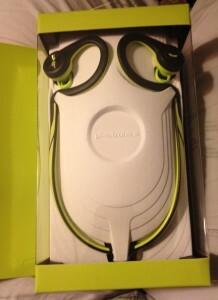 Also, the note is color-coordinated with the box and contents in Lime Burst (the headset also comes in Electric Blue). Enough already, let's open the package. The front piece of the box opens like the cover on a book. It reminded me of the Lifesavers “A Sweet Story” packages my parents used to get for us kids at Christmas. Anyway, peek inside! Pretty, right? The picture doesn't quite do it justice, the color is much nicer live. Also, you can't tell, but the piece connecting the two earbuds is flexible like a cable, not stiff like what I suppose are now “old-fashioned” headphones like the kind that came with the Walkman. Awesomeness note: this makes them super adaptable to different sizes of heads, and you can wear them under or over headgear! Charging is simple. First pull out the small tab to slide the cover off of the plug receptor. Plug the charging cord into the receptor, and then connect the other end to a USB power source (e.g. computer, wall-wart). Rings around each bud turn red when the power is connected, and blue when charging is complete. Final step, pair the headphones with the iPhone. Boom. I've now taken these out on short runs like the Road Runner Sports Adventure Runs, and on long runs like the Rock ‘n' Roll Virginia Beach half marathon. So far, I love them! There are a few features I haven't tried yet. Phone usage. Use the buttons to switch between music and phone calls without fuss. Armband case, because I'm either holding my phone in my hand (Adventure Run uses a map) or it is in one of my skirt pockets, so my biggest problem is what to do with the headphones when I'm done running. I tried hanging them around my neck, but if I bend over I lose them (which could be perilous in a porta-potty!). After one run I put them around my neck, and secured them with a Buff. Another time I put them into a free pocket. If you haven't tried the Plantronics BackBeat Fit and are in the market for wireless headphones or Bluetooth headphones (these are both! ), I highly recommend these headphones. I love them so much I've committed to a year of membership in Rock My Run, now that I know I have reliable, non-tangle, headphones. But hey, don't just take my word for it! Take a look at reviews by some of the other BibRave Pros!